Wednesday December 22nd 1920 It was a cold ay. I was sewing for myself. Hattie went down to stay with William while Fannie went to town. I wrote to Arch Stinson, Mrs J S McLeod & Charlie Moon in evening. 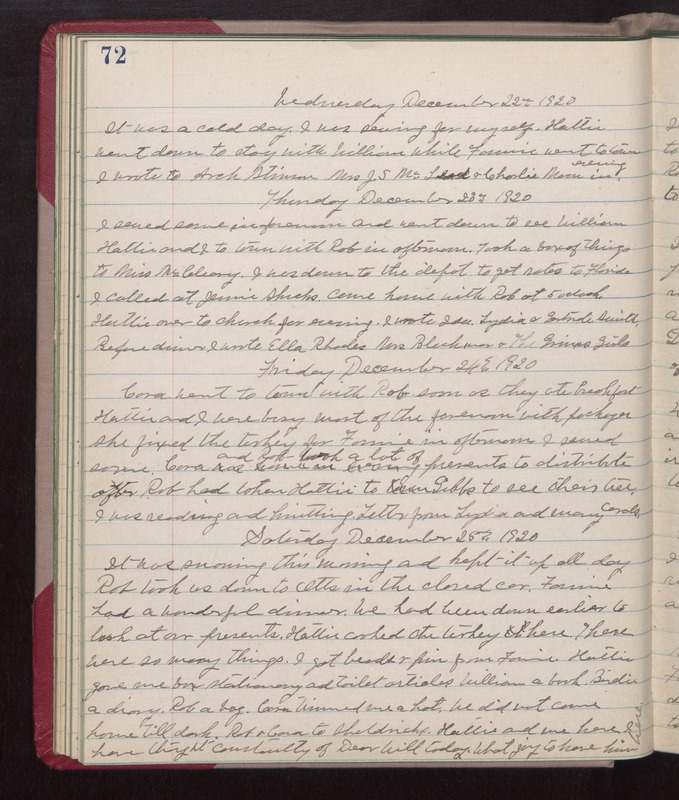 Thursday December 23rd 1920 I sewed some in forenoon and went down to see William. Hattie and I to town with Rob in afternoon. Took a box of things to Miss McCleary. I was down to the depot to get rates to Florida. I called at Jennie Shucks. Came home with Rob at 5 oclock. Hattie over to church for evening. I wrote Ida, Lydia & Gertrude Smith. before dinner I wrote Ella Rhodes, Mrs Blackmor, & The Grimes Girls. Friday December 24th 1920 Cora went to town with Rob soon as they ate breakfast. Hattie and I were busy most of the forenoon with packages. She fixed the turkey for Fannie in afternoon. I sewed some. Cora and Rob took a lot of presents to distribute. Rob had taken Hattie to Gibbs to see their tree. I was reading and knitting from Lydia and many cards. Saturday December 25th 1920 It was snowing this morning and kept it up all day. Rob took us down to Otts in the closed car. Fannie had a wonderful dinner. We had been down earlier to look at our presents. Hattie cooked the turkey here. There were so many things. I got beads & pin from Fannie. Hattie gave me box stationery and toilet articles. Will a book. Birdie a diary. Rob a bag. Cora trimmed me a hat. We did not come home till dark. Rob & Cora to Sheldricks. Hattie and me here. I have thought constantly of Dear Will today. What joy to have him here.